Brass — all known copper and zinc alloy, which can be composed of 5 to 45%. Brass to zinc share of 5−20% is called the red or red brass, zinc 20−36% share — yellow. Brass to zinc share of over 45% does not apply. Zinc is an inexpensive metal. Its administration improves antifriction composition, mechanical and technological properties and simultaneously reduces the cost of brass. Therefore, you can buy the brass at a price much cheaper than copper. Although the zinc reducing the thermal conductivity and the electrical conductivity of brass, but gives greater strength and corrosion resistance. On the composition of brass components classified into simple and special, in chemical composition to the single-phase, two-phase and multiphase. On the composition of the components distinguish n Simple, brass, or double, mark the letter A and the number that indicates the percentage of copper in the alloy. The proportion of zinc is calculated on the balance of 100%. Special brass, or multicomponent, besides zinc contain additional alloying elements. Therefore marking comprises the additional letters and numbers indicating an alloying element and its percentage. Multi brass is divided into the following classes (after the zinc) of alloying components. The chemical composition. Brass is divided into single-phase, two-phase and multiphase. The vast majority of ordinary brass and some special belong to a single-phase (α-brass, and represent a solid alloy of zinc and copper (α-phase), they have the best ductility at all temperatures. Therefore, the single-phase version of α-brass perfectly processed at low and high temperatures. Biphasic include brass and fragile elements of solid phase (α + β phase), which leads to restriction of the pressure treatment, it is possible only at high temperatures. With the increase in the proportion of alloying elements arise fragile phase, so the doping does not exceed 0.5−3%. Phase composition of forms belonging to the classes of casting or wrought brass, determines the properties and the ability to produce a variety of products. Flat rolled brass produced hot-rolled and cold-in the form of tapes, foils, plates and sheets of brass of various brands. Brass tubes produce cold-deformed or extruded from any brand of brass. Pipes are manufactured according to the special purpose TW Widely boiler pipes are used for best corrosion-resistance. continuous casting method is possible to produce a cheap round billets. Brass wires provided in soft, semi-solid and solid states diameter of 0.1 to 12 mm. It is used for manufacture of rivets. solder or electrode in EDM machines. 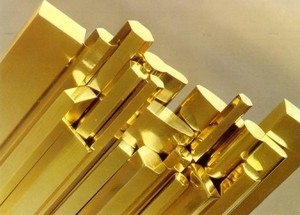 Brass bars (round, square, hexagonal) combines excellent mechanical properties with improved anti-friction properties and corrosion resistance in atmospheric conditions, in river or sea water. The main advantages of metal brass over other alloys are special mechanical and corrosion properties of brass rolling. High technology brass allows almost all types of steel. Brass corrosion properties favorably distinguish among the copper alloys. However, harvesting of the simplest and most special brass in the cold-state and after machining, are subject to stress corrosion cracking. The main cause of the cracking is the residual tensile stress in the metal and precipitating factors as the presence of moisture traces of sulfur dioxide and ammonia in the atmosphere. To prevent this phenomenon, the product after the completion of treatment are subjected to low temperature annealing, in which the internal stress is removed. Naturally. brasses that different types have varying degrees of corrosion resistance. The special resistance of some brasses to the specific environmental conditions and exploitation (for example, aeration and calm state, or within, the impact force) defines the scope of their application. Scope brass immense. The type, component and chemical composition depends on the price of brass. Before you buy brass, should clearly define the scope of use. In the price of non-ferrous metals can be found with our prices. This type of brass contains in its composition a significant proportion of copper (90%), as a result of metal brass has excellent anti-friction, corrosion resistance and sufficient ductility. This brass and steel easily welded together to form a bimetal steel-brass. Bright golden color of a brass allows you to apply it in the manufacture of art products, furniture and window fittings. Double wrought brass used for the production of the following products: capillary tube and radiator, heat engineering and chemical equipment, auto parts, chemical equipment liner, virtually all of stamped parts and products, bolts, nuts, pipe condensers, tubes with thick walls. Multi-wrought brass the most beneficial in the manufacture of condenser tubes used in the marine industry, parts for ships or vessels, chemical equipment and electrical engineering, aircraft parts, bearing shells. And manometric tubes, spare parts, valves and fittings fastening, screws, nuts, plugs, parts for watches, matrices for printing equipment, machine parts with high corrosion properties. 2. Casting Brass is best suited for the clamping nuts and bolts of massive worm, fragments with high resistance to corrosion, cast reinforcement elements, bearings, separators and sleeves, Parts of responsible units for work at high temperatures up to 300 ° C, automobile fittings for hydraulic systems . 3. Jewelry brass recovered by the method of processing and color (so-called granular brass) light yellow, green, golden and bright yellow. In stock company «Electrovek-steel» in the presence of a diverse range of non-ferrous alloys at the best price. Brass hire, supply wholesale and retail, fully meets the needs of our customers. The popularity of the alloy due to the huge variety of products, excellent quality products, its low cost. All products of our company are manufactured under full control of the process chain, which ensures 100% quality guarantee. We are ready to supply the non-standard products customized settings. Technological capabilities in the production stages make it possible to carry out individual orders in the absence of the basic version of the requested type of the product. Lead times are minimal. The price depends on the volume of supply and the implementation of additional conditions. flexible system of discounts for bulk orders.